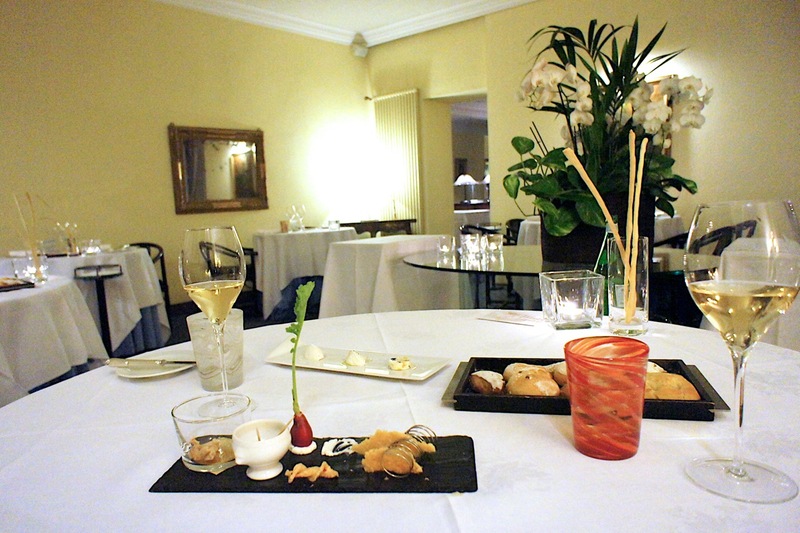 Il Sole di Ranco is a one Michelin star restaurant by Lake Maggiore at the border between Lombardy and Piedmont. It has very nice accommodation as well and the property sits at the edge of the lake and supposedly has wonderful views. I say 'supposedly' because we got there late in the evening when it was already dark and hence couldn't really see anything. It is located in a small hamlet called Ranco which is quite a drive North from the main expressways. Apparently during lunchtime (or the summer when the sun sets late), diners can eat at the open air outer courtyard which faces the lake. Instead, we had to dine indoors as it was cold outside. The dining room is quite simple sparse in furniture and fittings, and when we got there, being the first diners, it was eerily quiet, and we didn't really feel comfortable till after the other diners got there and the room filled out. Like many Italian restaurants in the countryside, this is a family-run establishment. It has remarkably been in the Brovelli family for more than 150 years and now the kitchen is helmed by Davide with his parents helping him run the estate. When we arrived, we were warmly welcomed by the mother, Itala, who was very charming and friendly to us throughout the dinner. 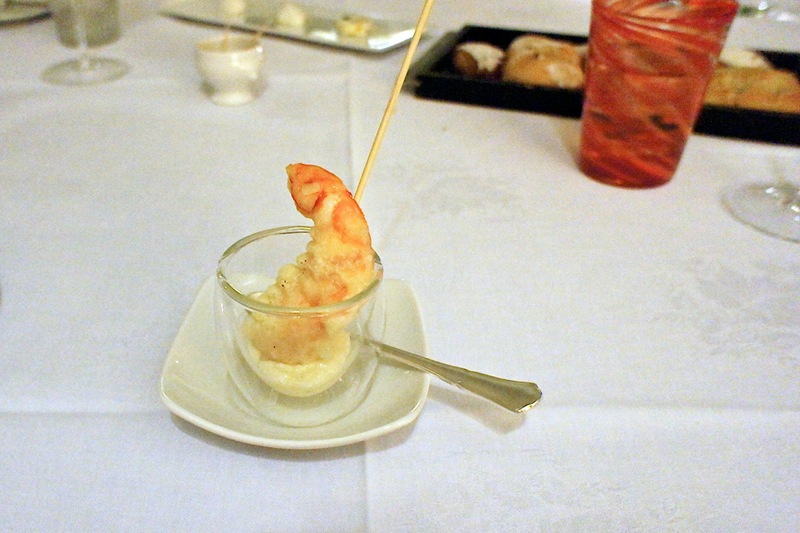 In addition to some bread, crackers, a raw radish and other snacks, the amuse bouche was a tempura prawn in a sour cream dip. This reminded us of the amuse bouche at Gunthers in Singapore (except that I hope that Di Ranco changes their amuse bouche more often than Gunthers). 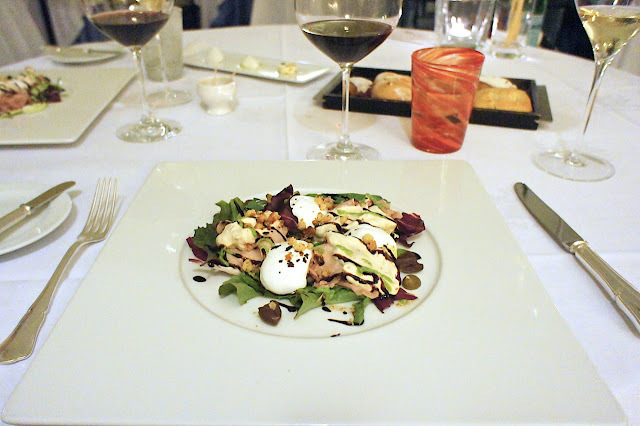 The food here was very reasonably priced, and one could have a set menu for EUR 30, 50 or 100 per head. We had rather heavy set menus the past few nights and hence went for the ala carte menu this time instead. The wine list was quite short I felt, and I managed to pick out a 2000 Le Vigne Barolo from Sandrone which was a familiar wine to us and was very good. 'Vitello Tonnato' - Cold Veal with Tuna sauce: We felt this was too busy. We liked the ones in Piedmont which simply had the slices of veal with the delicious tuna sauce, but this one had cheese and salad and nuts and we thought it those were distractions to the veal and tuna sauce. 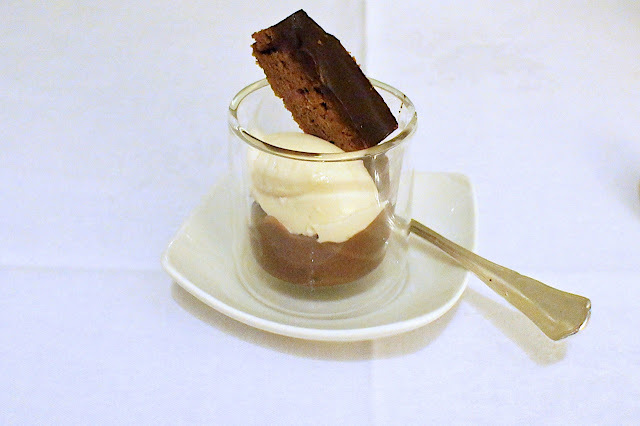 Tajarin con Tartufo Bianco: I ordered this off the menu. 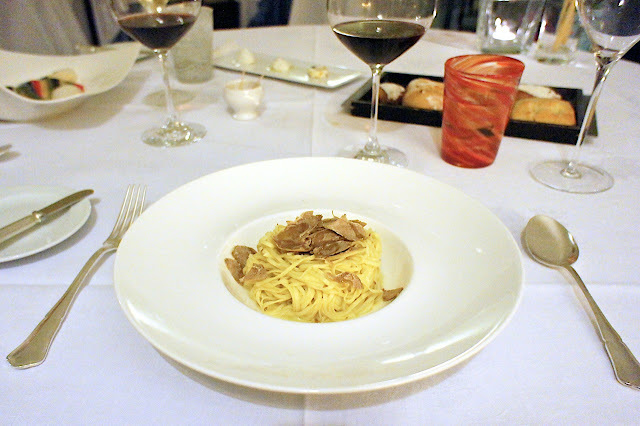 Surprisingly it was the only time I had white truffles on this trip (this was because though truffle season had started, the unseasonably warm autumn resulted in the truffles not being ready to be 'harvested' yet). This was done as I had expected it to be, but I felt that the truffles lacked the fragrance of those from last year (not the fault of the chef, just the quality of the white truffles available to him). 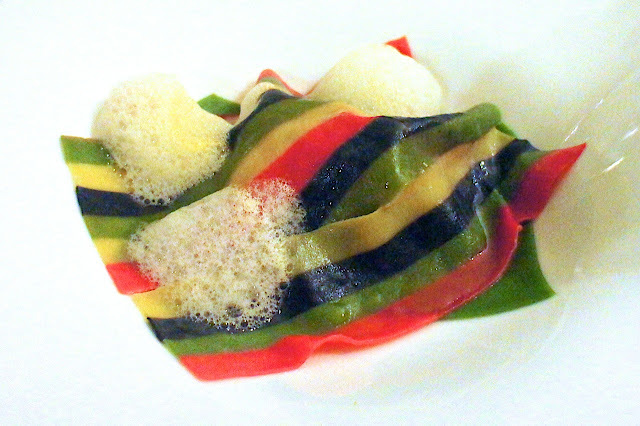 Scampi Lasagna 'Del Sole', Passito Wine Sauce: This was a Di Ranco specialty. It was quite a visual treat and didn't look or taste like a traditional lasagna. 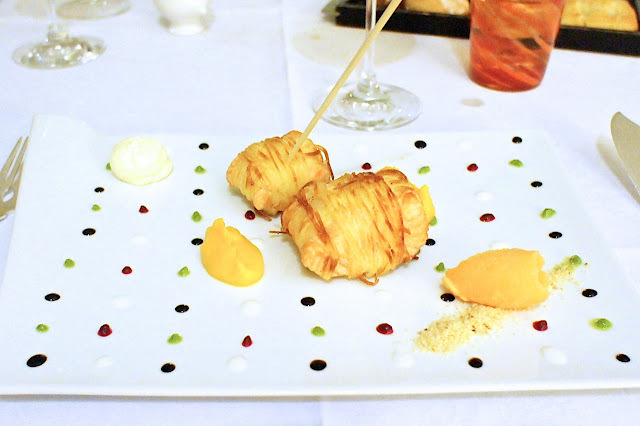 Salmon wrapped in crispy threads of Potatoes, Carrots and Oranges Purea, Sour Mayonnaise: I absolutely loved this. Despite my initial reservations (I almost never order salmon in a fine dining restaurant), I was assured by Itala that I wouldn't regret ordering this dish and I didn't. The potato strips which wrapped the salmon (looked and tasted like it was done in the style of a beef wellington but with potato instead of dough) matched perfectly the salmon in taste and texture. 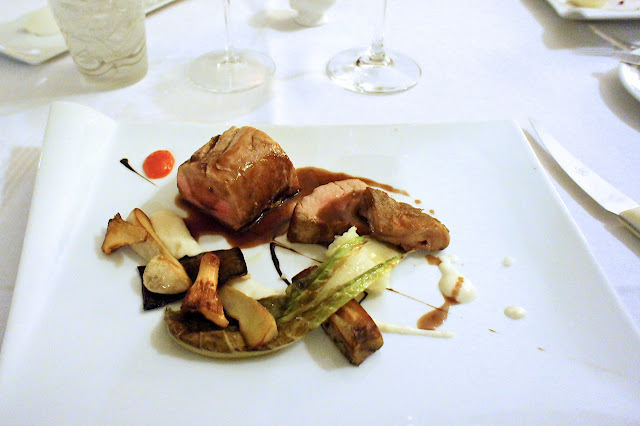 Lamb with Herbs: This was nicely cooked without being particularly memorable. Pre-dessert: This was a tad bit heavy for a pre-dessert (which is usually a refreshing sorbet or some fruity dessert), but the chocolate and ice cream were very nice nonetheless. 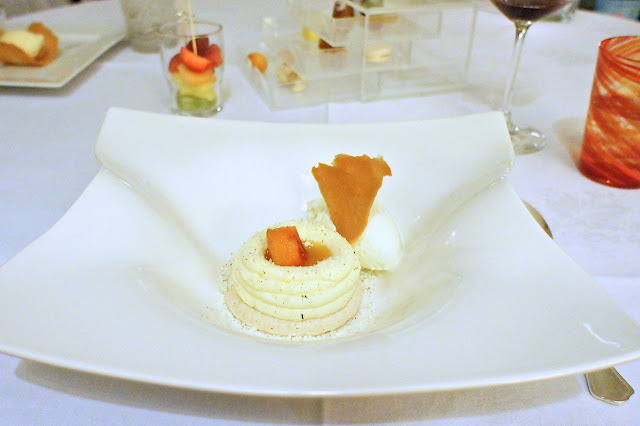 Peach and Almonds Nougat, Lavender Ice-Cream: This was a very good dessert. 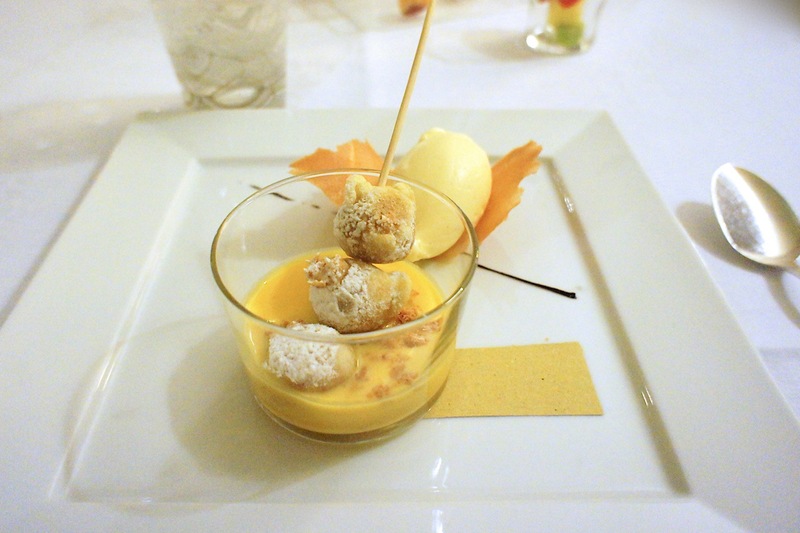 Just the type of fruity and light dessert after a sequence of heavy meals over the past week. Amaretto and Mascarpone Cheese Pancake, Vanilla Ice Cream and Pumpkin Coulis: This was also very refreshing, though the amaretto tended to be quite filling. 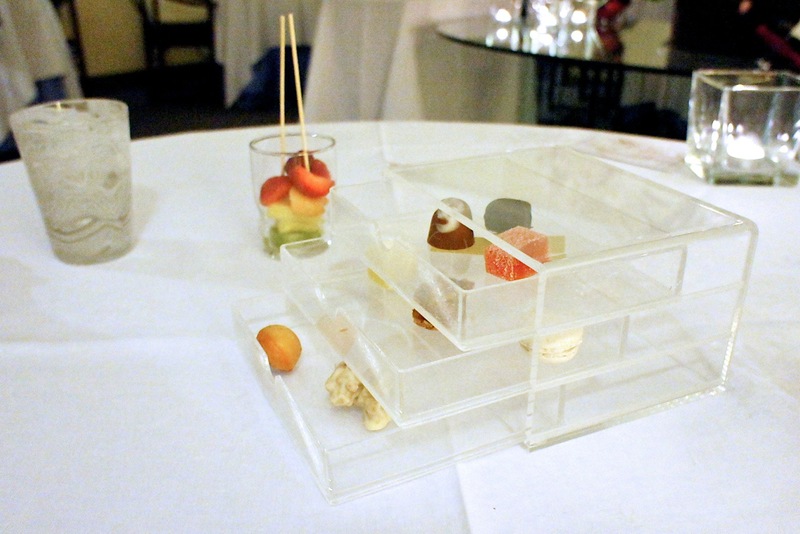 Petit Four: We typically don't appreciate petit four which have only chocolates or macaroons. Some variety is needed especially if we are very full or have had chocolate for dessert. In this case, the mini madelines and sugared jelly sweets were polished off by us. Final Thoughts: A good restaurant serving traditional Italian fare, where hearty food, great wines and warm service at a reasonable price trump any need for innovation or cutting edge cuisine. We wouldn't drive all the way there just to eat there again, but we are curious about the outdoor views in the day and could try to have lunch one day just to take in the sights if we find ourselves in the Lake Maggiore region again.